Grand River Rubber & Plastics was an early adopter of the ISO 9001-2015 certification, having completed it in December 2016. By September 2018, ISO 9001-2008 will not be viable, so now is the time to find manufacturers and distributors who have the updated certification. 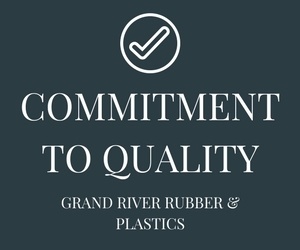 Grand River Rubber strives to be on the cusp of the latest certifications and trainings, providing our customers with great quality far before certifications are required. Grand River is dedicated to checking quality throughout the manufacturing process. Our factory has a multi-station SPC program called Infinity QS. Infinity QS is employed throughout our plant’s divisions. Our Drum & Pail division uses Infinity QS during the extrusion process. The program allows us to measure the OD and wall thickness of the tubes when they are extruding. Lathe cut gaskets are manufactured through a precision extrusion and curing process, with highly automated cutting equipment. Our lathe cut gaskets are custom manufactured to our customers’ specifications. Our Infinity QS program is utilized throughout the lathe cut process, measuring the wall thickness to the specification and also is used in the finishing step of our process to measure the cut size of the gaskets. Grand River has a Microview Units Vision System that integrates with our SPC program, Infinity QS. This unique program can measure ID OD wall thickness and print out capability reports. Companies in our space typically use graduated cylinders to measure ID. When using graduated cylinders, you can only measure to 64th of an inch depending on how tight or loose the part sits on a pole. Also, the graduated cylinder process makes it unable to say the exact dimension of the part with certainty. Our system, however, can measure down to one ten thousandths of an inch. We use a Production Part Approval Process (PPAP) which is most manufacturers in our industry do not use. The majority of our customers require a first article inspection. We take 6 pieces, dimensionally lay them out, then do the ID/OD/Wall/Cut Size/and durometer. Our lot-control system insures full traceability from raw materials to final inspection. Through continuous quality improvement we are able to respond with innovative refinements to produce superior products. Supervisors and managers at Grand River Rubber all have access to Infinity QS and can monitor progress on the floor and see statistically if parts are running to standard. All of the supervisors and managers have access to program. Our management staff monitor product production in real time and statistically see if products are running properly.